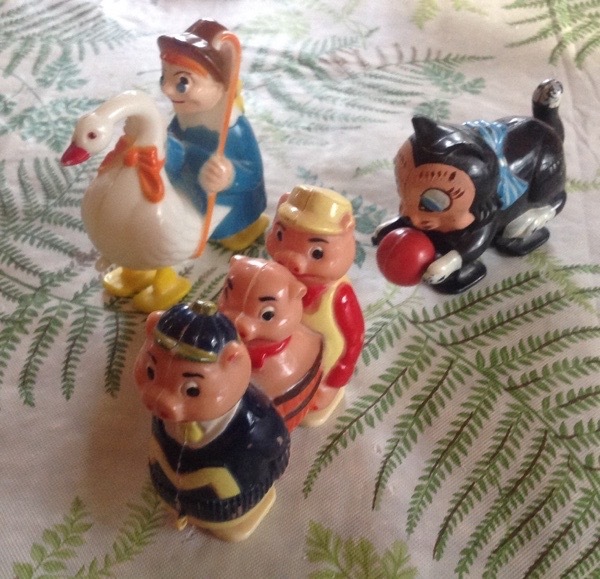 Among my prized possessions is a set of old fashioned walking toys. Made in Hong Kong of hard, painted plastic, these three charmers walk without the benefit of batteries or electricity. Put them on an inclined surface and just watch! Their little legs swing in synchrony and carry them along. As they walk, they make a tiny clicking noise. Sometimes they fall over before they reach the end of their path, but usually they forge on to the end. 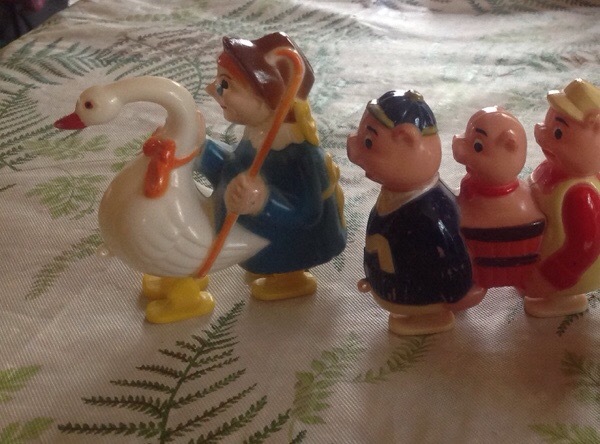 The Mother Goose and Three Little Pigs were a gift from Santa about fifty years ago. The clever black cat with his red ball was added to my collection later. 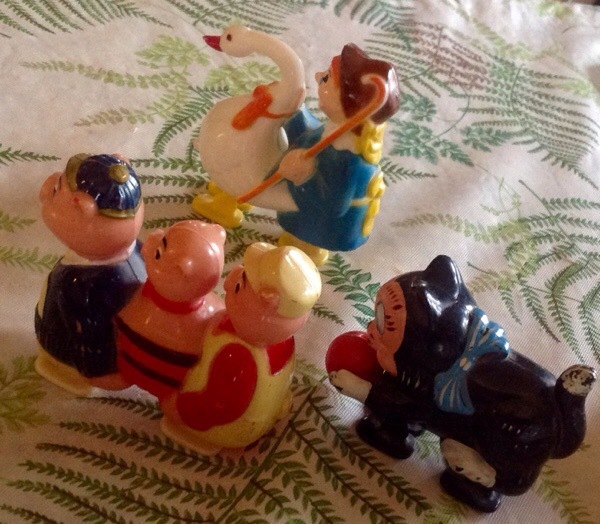 This year I am going to include these fellows among my Christmas decorations, a small celebration of Christmas Past! 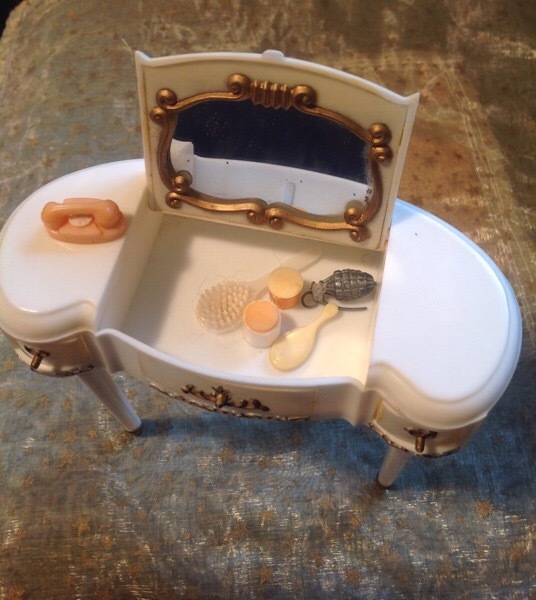 Do you have any of the toys from your childhood Christmases? 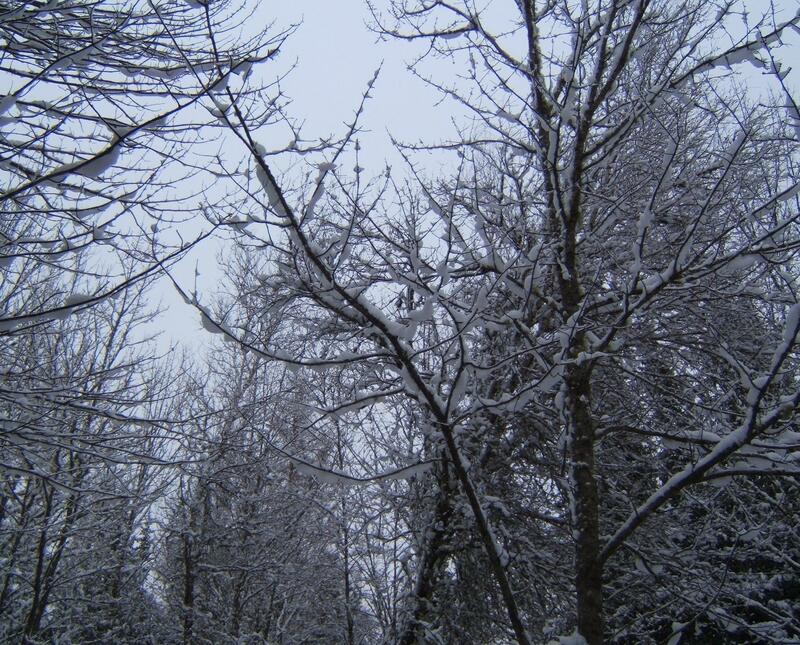 Although it is only late November, I find myself shuddering at the approach of winter. Perhaps it is the arthritis in my bones. Perhaps the need for a quilt as soon as the thermometer registers less than zero. Perhaps the climbing out of bed while the sun is still asleep. 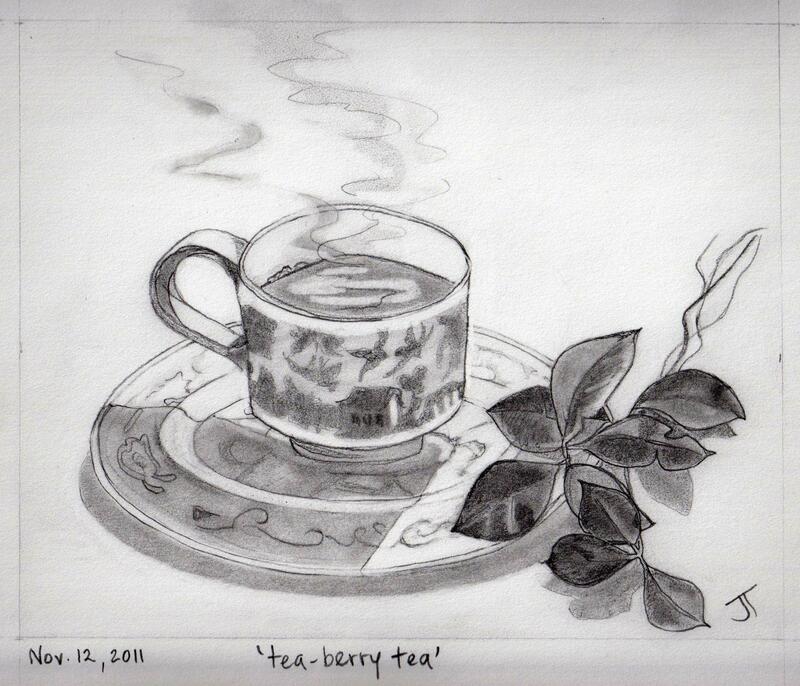 1. hover over a cup of tea each morning – my current favorite is Scottish Breakfast, a gift from my niece. 2. read, read, read – I read so much I usually feel guilty … but not this winter – I am going to read as much as I can – my current favorites are Elly Griffiths, Ann Cleeves and Ann Granger, all mystery/crime novels from the UK. Just to keep with the spirit of the season, I am also re-reading Edwin Way Teale’s Wandering Through Winter (1965), the Pulitzer-winning book describing his four month, 20,000 mile winter journey through the USA. 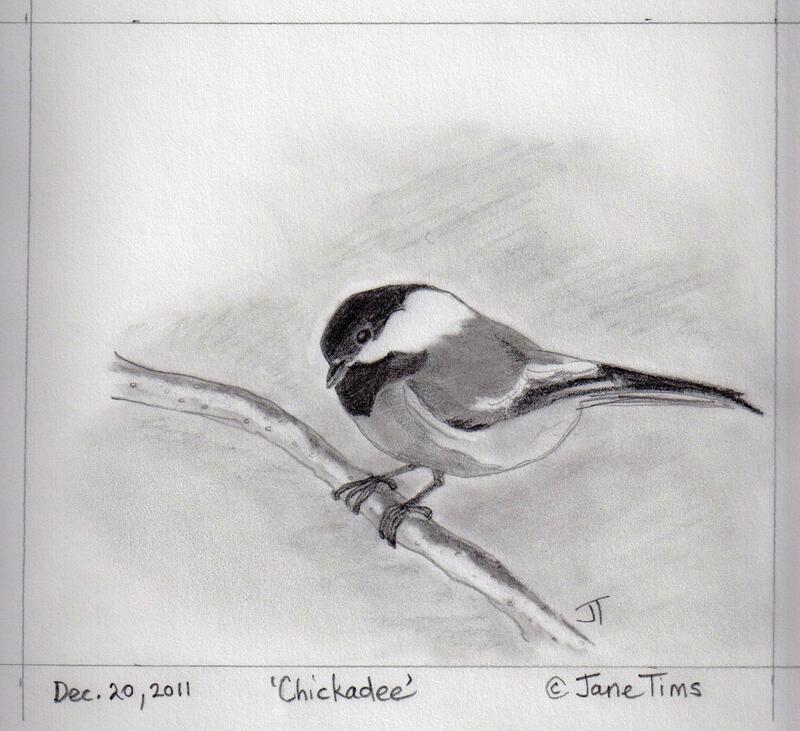 3. watch the birds – I am determined to see a Cardinal at our feeders but, really, anyone will do … Chickadee-dee-dee! 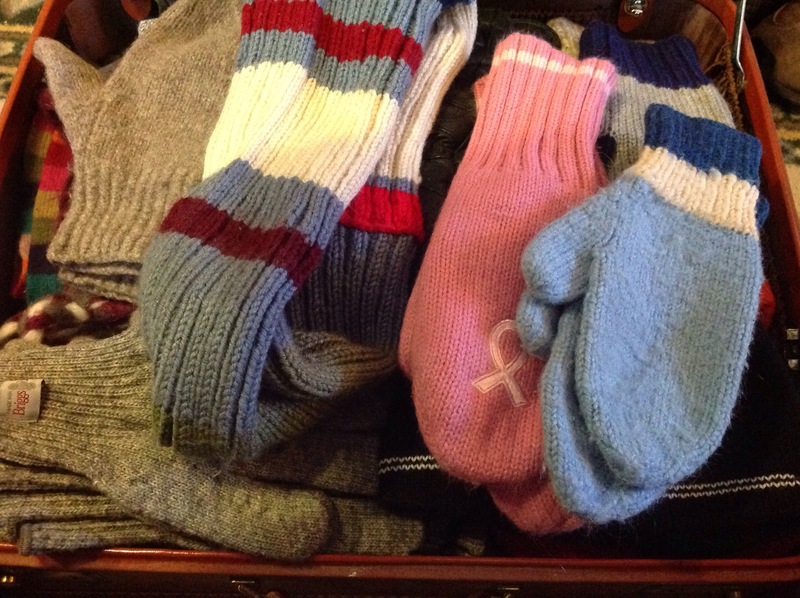 4. bundle up really well and go for a walk each day – I have had my wool coat dry-cleaned and I have cleaned out an old leather suitcase to store our mittens and scarves in easy reach. 5. Make a couple of small quilts. Working at a quilt is one of the warmest activities I know. 6. Knit a few pairs of socks, another warm activity. I am a good knitter … I can knit anything. 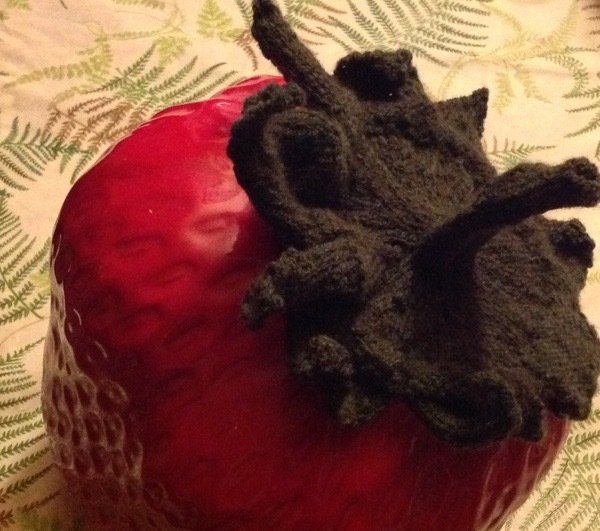 Once, the top to my strawberry cookie jar broke and I knit a new top for it! 7. Enjoy sitting in front of a fire. This includes my small electric fireplace, our big woodstove, and, outside, our stone fire pit. 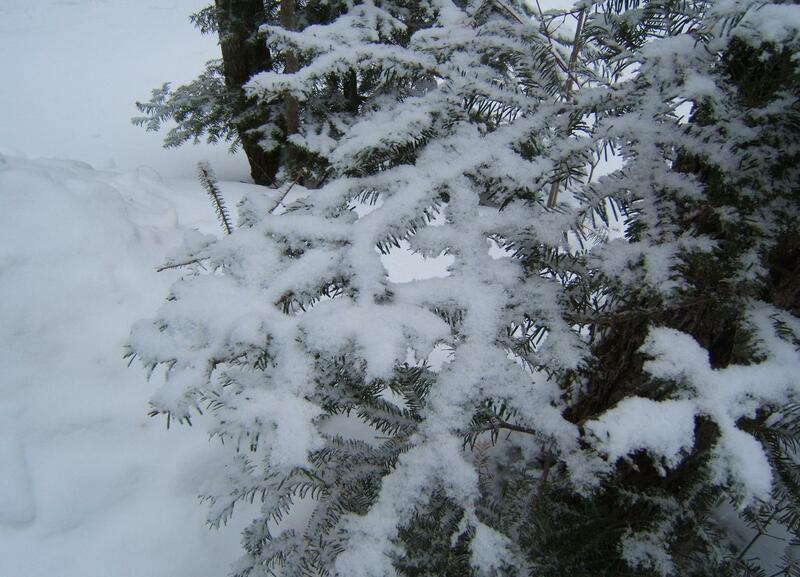 Do you have any strategies for making winter the best season of the year? 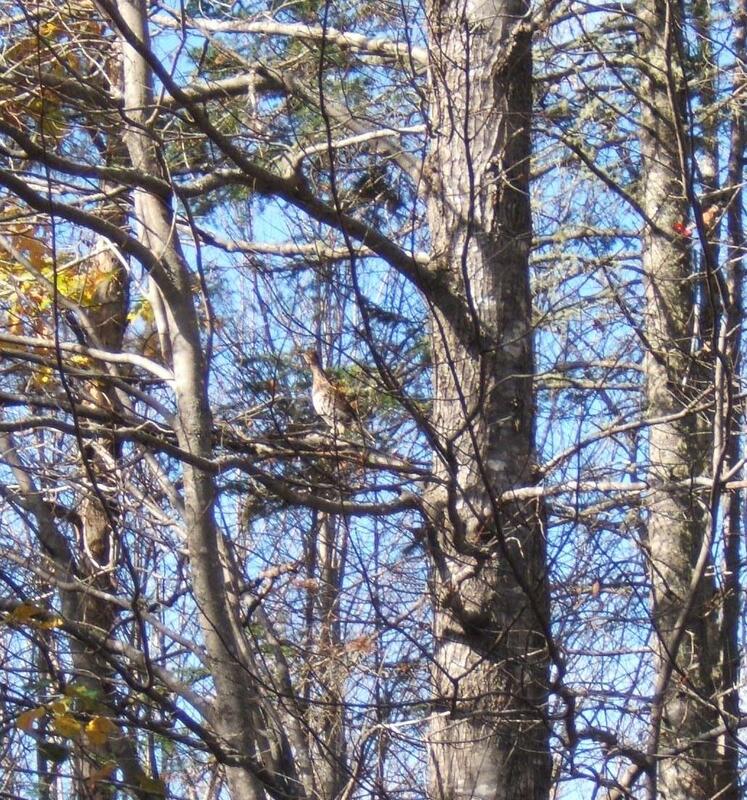 We share our grey woods with so many plants and animals. Sadly, our interactions do not always benefit the wild life. The big panes of glass in our picture windows have brought disaster to so many birds. If the sun shines just right, the glass is like a mirror. When a bird sees the reflection of trees and sky, it must think it is flying deeper into the woods. I find keeping the window curtains closed removes the mirror illusion and prevents some collisions. Sometimes, we will hear a thump and by the time we investigate, the bird will have recovered. Sometimes the bird is not so lucky. A milestone of our 2014 summer was certainly Hurricane Arthur (July 5). For an account of our encounter with Hurricane Arthur, see: https://nichepoetryandprose.wordpress.com/2014/07/14/arthur-during-the-storm/ and https://nichepoetryandprose.wordpress.com/2014/07/16/arthur-after-the-storm/ . For six days after the storm we were without electricity and learned to live a different life, deciding how to allocate the power from our small generator and bringing water in from diverse places. The biggest long-term result of the storm, however, was the damage done to our big red maple. The maple is at our front entry way. It has grown from a small sapling – my husband could circle it with thumb and forefinger when we built the house 35 years ago – to a huge tree. It is our best producer at maple syrup time and spreads a carpet of red leaves in a perfect circle in our driveway. Best of all, it has a ‘voice’. When I arrive home or leave, it ‘squeaks’ to me, the result of two branches rubbing together in the slightest breeze. After the storm, we congratulated ourselves on how few of our trees were damaged. Then I looked out of the den window and saw – the winds had not spared the red maple – one of the big branches had a wide split in the wood. 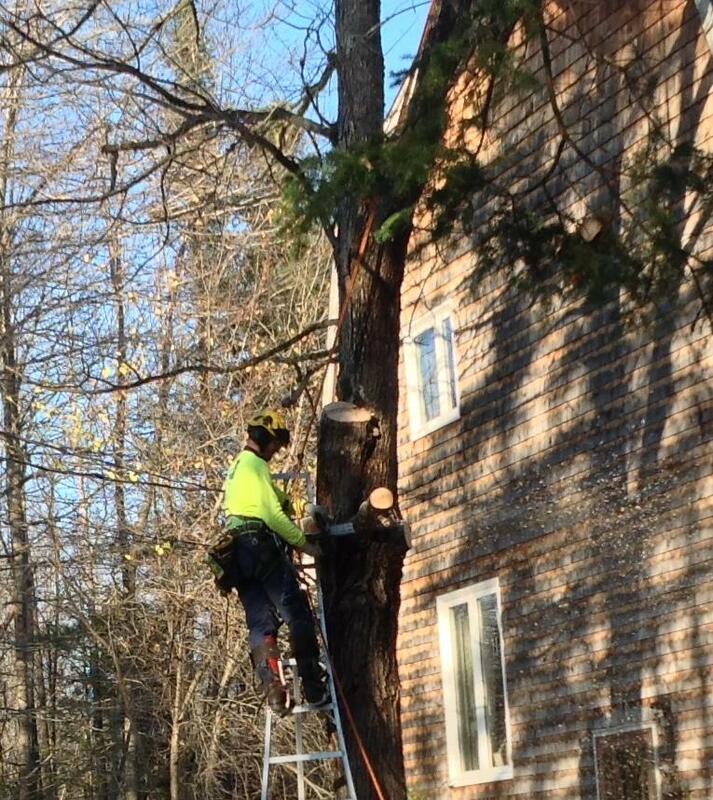 At first, my husband thought he could take the big limb down himself. But after removing some of the smaller branches, it was obvious that trying to cut the branch ourselves would be dangerous. 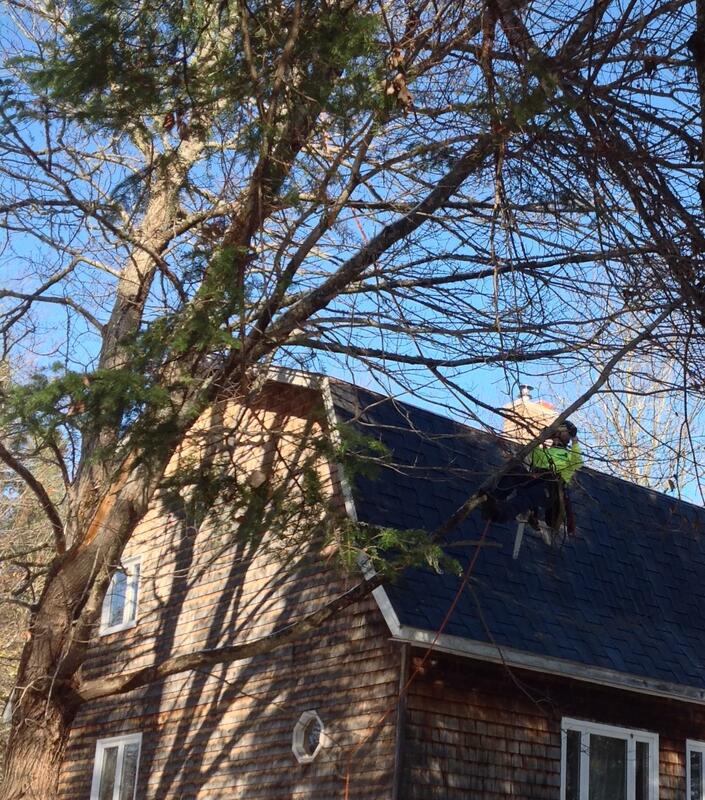 The tree is close to the house and power lines and there was no easy way to safely control the fall of the branch. 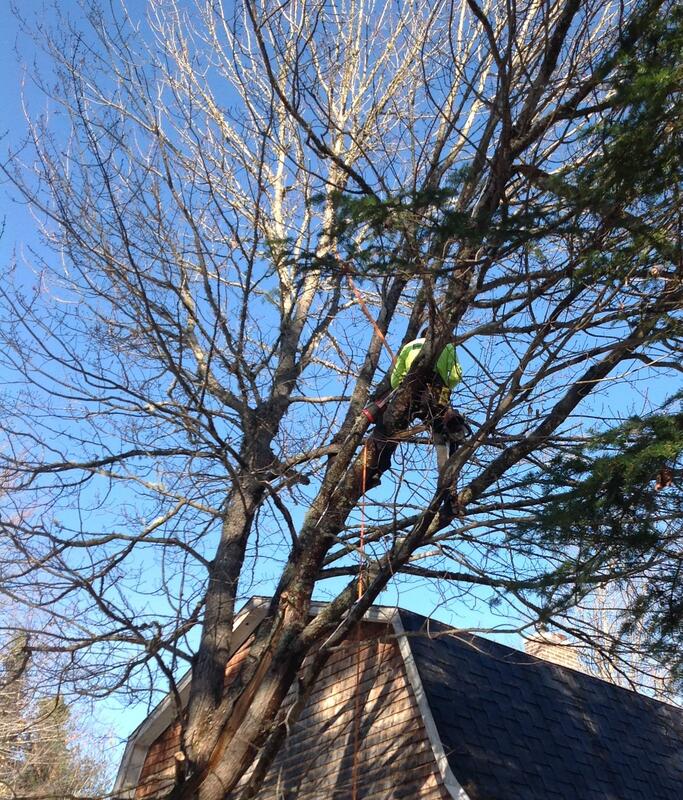 We decided to turn to the experts and called Treecologic, since they are fully insured. They also have a trained arborist and an excellent reputation. Their Vision statement is ‘promoting a safe & healthy urban forest’, so they were the tree removal company for me! For more information on the company, see http://www.treecologic.ca/. 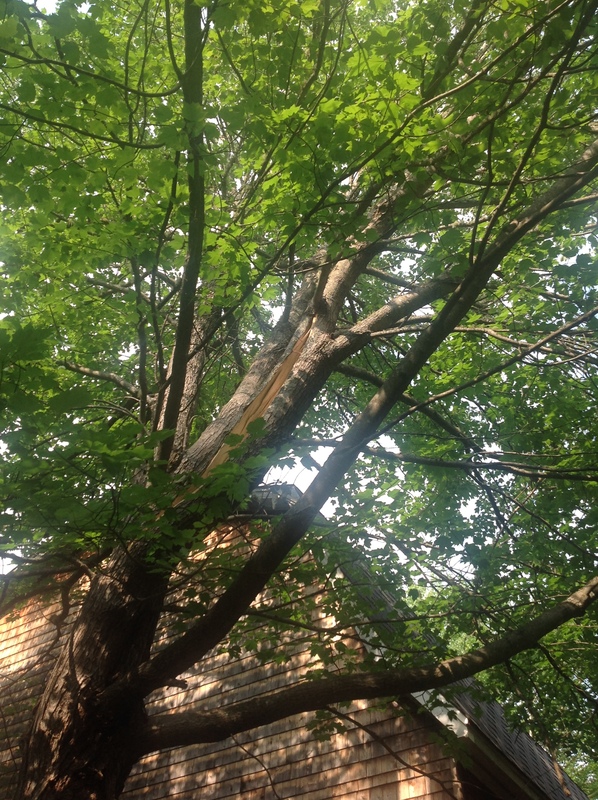 Since there have been so many people in the Fredericton area with downed trees because of Arthur, we knew it might be some time before Treecologic could help us. We spent August through October keeping vehicles away from the risk zone under the tree. On Halloween night, we put up ‘Caution’ tape to keep the spooks from danger. And every day I tiptoed to our front door, convinced I would hear a crack as the branch came down on my head! 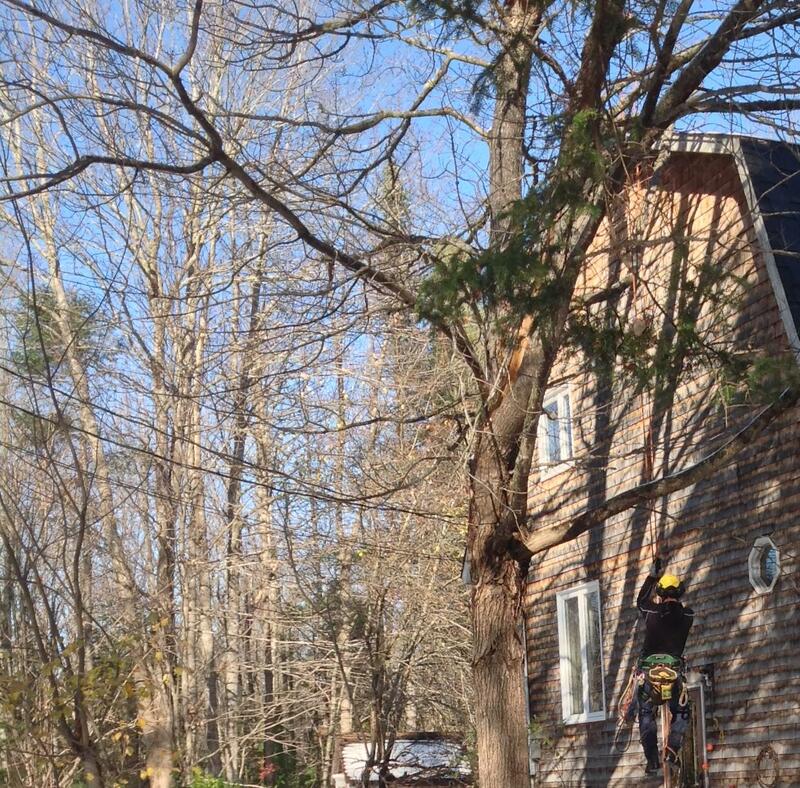 Then, as promised, Treecologic arrived, ladder, chain saws, climbing ropes and all. They worked for almost three hours, taking down a big white pine tree planted too close to the house and trimming branches from some of our other maples. 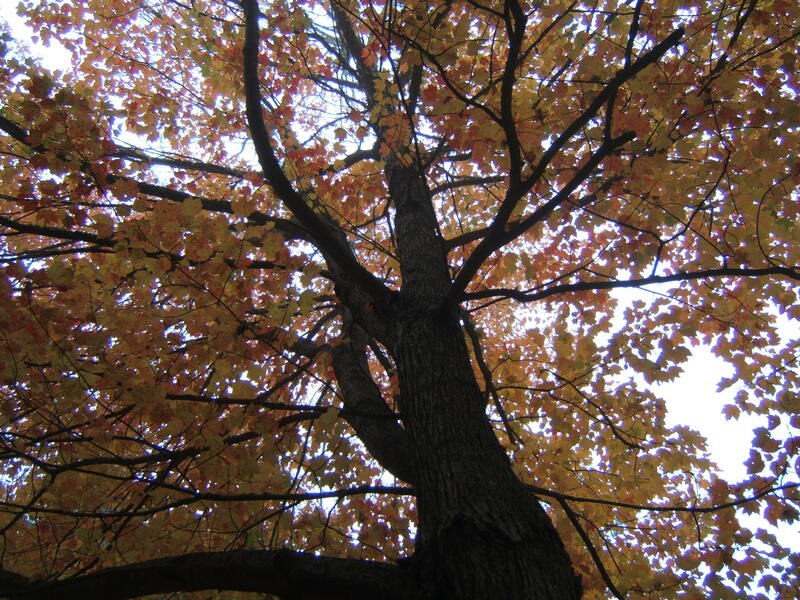 Then the arborist fixed a line in the highest branches of the red maple, put on his climbing belt and hoisted himself into the tree. Every move he made was calculated for safety and for the health of the maple. Working his way through the tree, using a very sharp pruning saw, he gradually removed the smallest branches, including some which were scraping against our roof. At first I felt alarmed to see a man in our very tall tree, but after realising how carefully he worked, I began to enjoy watching the process. 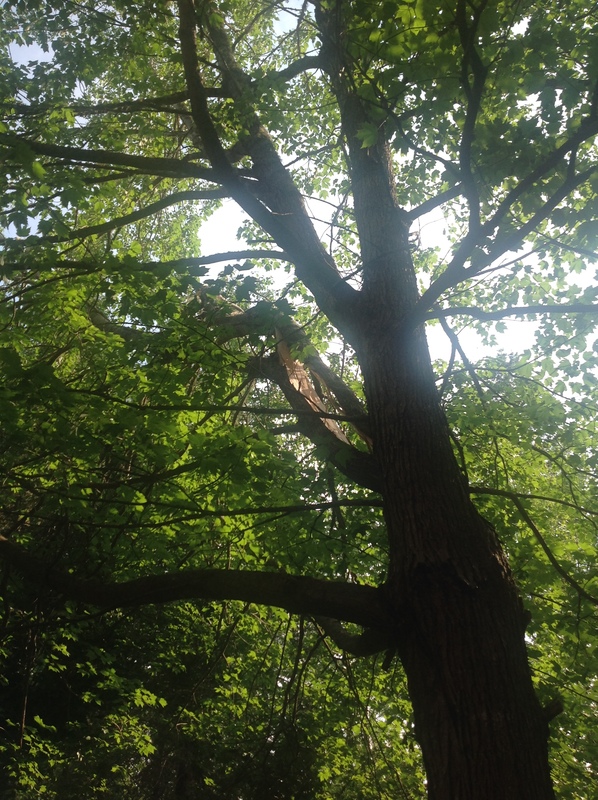 To be an arborist, I now know, requires an understanding of the tree’s biology and health, but also dexterity, strength, flexibility and fearlessness. At the last, he tackled the split branch, first removing remote branches, then finishing with the chainsaw from a ladder. Great work, Treecologic ! Our tree will take a while to recover from it’s adventure with the hurricane. Losing almost a third of its canopy will mean a couple of years of rest before another pruning. 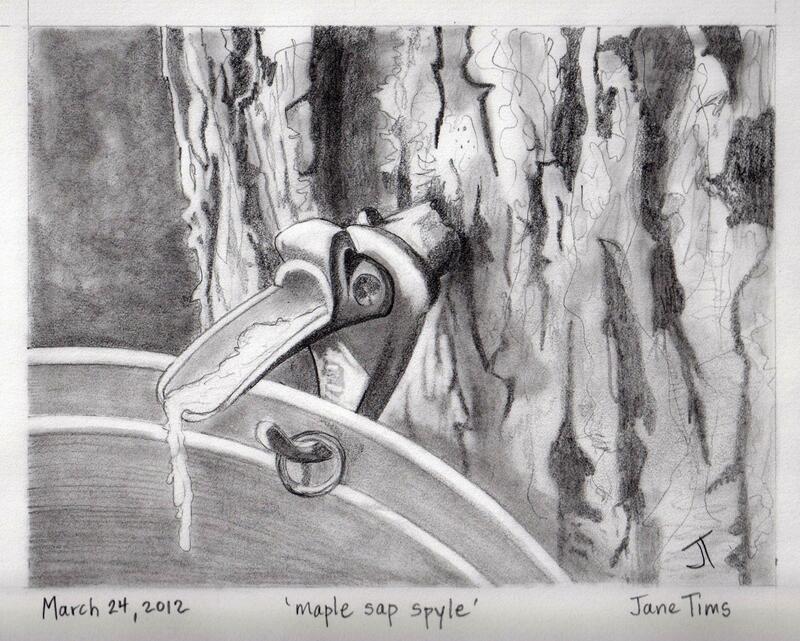 No tapping for maple sap for the next few springs! Meanwhile, the pruning has given us lots of hard wood for next year’s wood stove and, once they dry out, lots of kindling and twigs for my campfires! Some will go into our wood chipper to add to the soft surface for our trails. 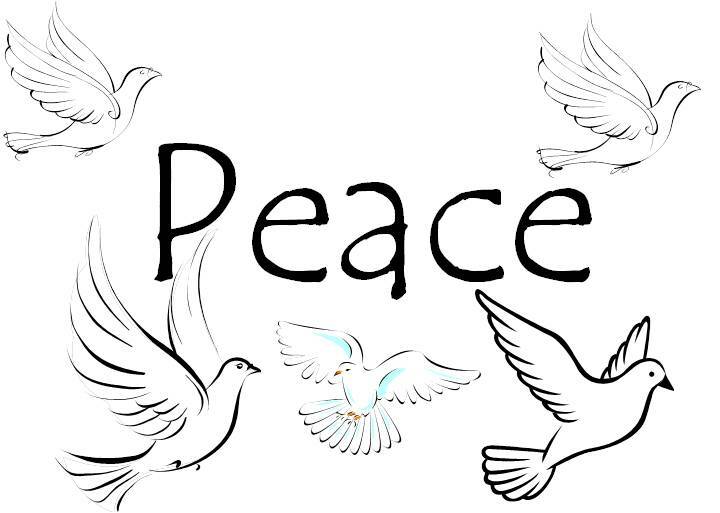 And, in case you were wondering, the tree still has its ‘voice’ since the branches that rub together remain! Published as ‘newfall: words escape me’, The Fiddlehead 196, Summer 1998.